Surfing in the Summer is quick and easy; boardies, rash guard and off you go. The only problem is there’s nowhere to stash a key (which in wetsuit season goes behind my calf). Surfers, runners, bikers, anyone who drives somewhere to get a workout has to hide their keys in the wheel well or under a rock and hope both the key and the car are there when they return. A product called HitchSafe is a 4 digit combination safe that goes in your trailer hitch. It has a drawer that slides out to put your key and other valuables. Some trucks, including those with sliding rear windows can be easy to break into and the HitchSafe provides a safe alternative. 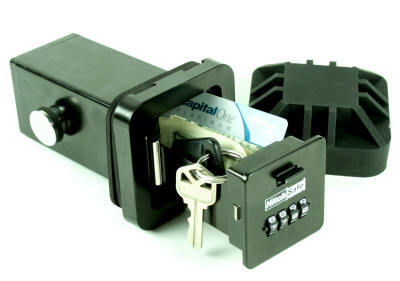 The HitchSafe is also a clever place to keep a spare key in the event you lock your keys in the car. The HitchSafe fits standard 2″ hitch receivers, with the exception of the Toyota Tacoma 2005-07 and 2007 Tundra, both have an extra band of metal around the receiver and require longer bolts. Also some 2005 Toyota Forerunner’s have OEM factory hitches with rounded corners ans require filing off each corner on the HitchSafe for it to fit. A rubber cover goes over the end of the safe to provide a level of protection from the elements and also makes the trailer hitch looks like any other. The HitchSafe is available on Amazon for $69.95.